Home remodelling is like many other industries, trends and styles change from year to year. At Thetford Residential, we believe it’s important to stay abreast of these trends so that we both know what’s popular in the market and how to implement new styles with our product. Here are some of the biggest trends we’ve seen develop over the past year. Bathroom with wall tiles One of the first things we’ve noticed is that people are trying to make their bathroom airier by letting more sunlight in. 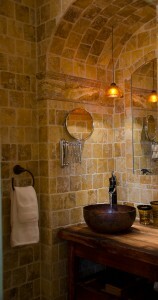 Natural lighting is one of the best ways to set the mood in a bathroom; it’s warm and inviting. People are spending more time than ever in the bathroom, which is why it’s important for people to enjoy it. By adding bigger windows and more pastel colours, you can really create something that’s more than just a bathroom. Everything old becomes new again, and bathroom styling and remodelling are no different. Over the past few years we’ve seen more and more people reusing old hardware, tiles and more from their bathroom. This creates a vintage look and feel, and if we know anything, it’s that vintage is in. Just like the car, more and more technology is finding its way into bathroom. Televisions, stereos or iDevice docks are not uncommon sights today. There are actually medicine cabinets that are specifically designed to house iPhones so you won’t miss any calls while applying your makeup or doing your hair. Technology is becoming a standard, even in the bathroom. The days of inexpensive linoleum and fake tiles seem to be over. One of the current trends is the use of high quality tiles. One of the best things about using tiles for your bathroom is that they are versatile and can be used with almost any style. These aren’t the only trends that are currently popular, we’re also seeing bold colours make a big comeback. Leave us a comment to let us know what trends and styles you’ve seen popping up. Also, don’t forget to contact us if you have any questions about the Thetford Residential system.